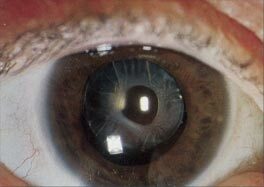 A cataract is a clouding of the lens in the eye. When the normally clear lens of the eye becomes cloudy, vision can become blurry. Cataracts are common with age and can occur in one or both eyes. The clouding usually occurs slowly, but can happen quickly, especially after trauma to the eye. While cataracts are not painful, they do cause many symptoms such as blurry vision, less details, glare while driving or reading, dull colors, changes in your glasses prescription and double vision in one eye. For patients who have cataracts, we offer small incision, no stitch cataract, surgery, as well as multifocal implant surgery, which replaces the patient's clouded lens with an artificial one that takes over the job of focusing. For more information on cataract surgery or lens replacement surgery, call 1-866-433-9200 to speak with our knowledgeable staff. Dr Assaad also offers the ACRYSOF RESTOR Cataract replacement lens, this new lens is a revolutionary multifocal lens that improves vision in a range of distances form near to far. It lets cataracts patients see the whole picture clearly, usually without glasses. The results can be life changing. Dr. Assaad will advise you if the ACRYSOF RESTOR implant is right for you.